Hizb ut-Tahrir (HT), a transnational Islamist movement described as a "conveyor belt" for jihadist terror, is preparing to play a much more active role in recruiting American Muslims. Although the cancellation of HT's U.S. Khilafah Conference this month was a setback, the group is likely to persist in its American recruitment efforts because it is committed to its ultimate mission: establishing an international Islamic caliphate (Khilafah). The organization's activities in Great Britain - perhaps its leading Western hub - may offer a clue as to the group's intentions in the United States. An edict entitled "The Islamic Rule on Hijacking Aeroplanes" advocates hijacking planes which belong to "enemy" nations: "If the plane belongs to a country at war with the Muslims, like Israel, it is allowed to hijack it, for there is no sanctity for Israel nor for the Jews in it and their property and we should treat them as being at war with us." Ata Abu Rishta, HT's international leader since 2003, has decreed that it is permissible to kill Israeli Jews. "There can be no peaceful relations with the Jews: this is prohibited by Islamic Law," Rishta wrote. "It is impossible to solve the problem of Palestine by peaceful means: what is required is actual war, in the form of Jihad." Hizb ut-Tahrir is prepared to wage jihad against non-Muslim countries which refuse HT's "invitation" to join its global caliphate. A booklet purchased at HTB's annual conference in London last year declared that "Allah has ordered the Muslims to carry the da'wah to all mankind and bring them into the Khilafah state. He...has legislated jihad as a method to carry the Da'wah. So the state must rise to declare jihad against the Kuffar without any lenience or hesitation." Hizb Ut Tahrir is a political Party, who,s Islam is it,s Ideology and Politics it,s work . The Aim of Hizb Ut tahrir is have the Muslim Ummah (1.8 billion Of Humans ) (resume ) the Islamic way of Life , Primarily by re Re Erecting khilafah back on earth . Khilafah state was abolished in march 1924 in Istanbul ( was called at that time , the Ottoman state ).Hzib Ut Tahrir does Not resort to any military Action , because it is Adhering to the Method of the prophet Mohammad ( May the peace of Allah be upon Him ) in building the first Islamic state in Medina city In The arbic Penisula around 660 BC , it was build without one drop of Blood shed . but Muslims did loose lives however during the process , they never retaliated back . 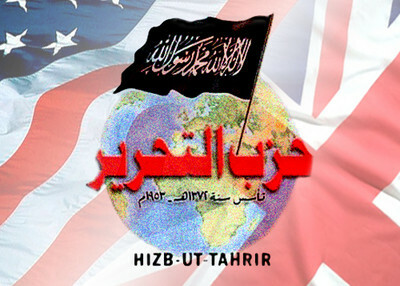 I recommend every one to visit the Hizb Ut tahrir web sites ,, go to www.hizb-america.org and read .. also www.khilafah.com can be of help ..
khilafah is Great for Muslims , for The Ecology system , the world and for America, as it will avert the need and the lure of Intervention into the affairs of Muslims by simply filling effectively the Vacum (Void ) of Power that Hover over the Muslim Land scape, Khilafah will open the eyes of All peopole of the world to an attractive and very convincing Alternative to the Capitalism who is the world with Smug and Unsatsiable drive for production and consumption . Khilafah Is good even to treat Obesity .. Think deep and you may agree .,. Malkawi said Hizb ut-Tahrir only wants to institute a caliphate in existing Muslim-majority nations and does not seek to impose it on Western nations like the United States and Japan. It is too bad that we have let the Muslim Jihadists get to where they are now. They should have been finished off in the crusades, centuries ago. Our trouble is, other than the politicians in DC, is that there is no defined enemy in terms of uniform or land. They are like flies, they are everywhere. They need to be stopped. I think we need to set up concentration camps for all of them like we did in WWII for the Japanese citizens that were in the US during the war. Our country gives them too much freedom to operate in our borders. It is the enemy within that will bring us down and the b**tards in DC can't or won't open their eyes to it. It doesn't help that our president is a Muslim either. I am sure there aren't any liberals or Muslims that will agree with me. But then again, we do have freedom of speech, don't we? Or do we? Ponder that one, will you? I suspect these comments will not be posted, too much censorship and that is a part of the problem in this country, too politically correct (and it is killing us)!